In the past, I haven’t been a fan of smart TVs for cutting the cord. Generally, I find the operating system on the smart TV either doesn’t support all the apps I want, the WiFi isn’t optimal, or a number of other issues that make me miss my Roku. That was until TCL build a TV around the Roku OS. The most requested feature readers ask for in cord cutting tech is the ability to have everything in one interface. The TCL Roku TV delivers on that by treating everything as an app. Just look at the picture below. Every port on the Roku TV shows up as an app on your Roku Menu. If you plug in your antenna, you can now go to the “Antenna App” and channel surf with your Roku remote. I plugged my Xbox One into one of my TCL HDMI ports, and now “Xbox One” shows as it’s own option. This will work with any device you plug into an HDMI port on your Roku TV. Volume control and power are all controlled from your Roku remote. I find this a lot more intuitive than the cycling of input screens typically found on most Smart TVs. This makes it easy to hop from Netflix to live TV on the antenna, then over to my Xbox to play Minecraft with my kids. 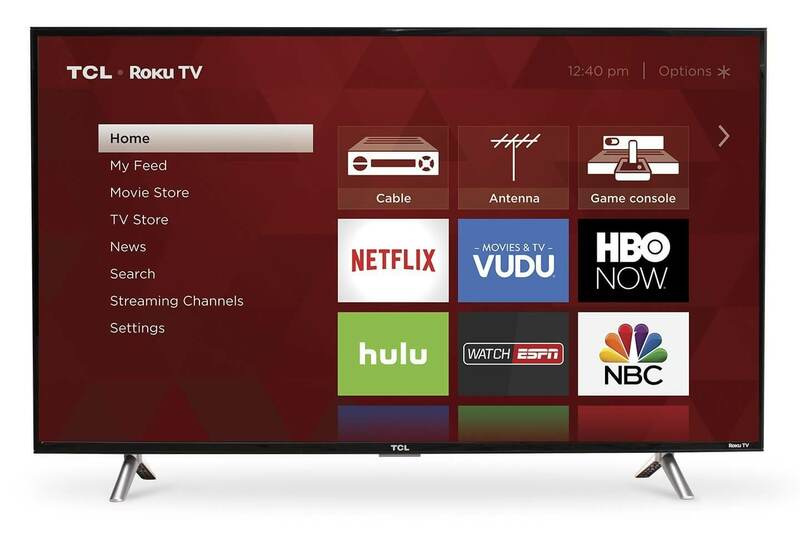 There are quite a few TCL Roku TVs on the market. However, I’ll make it easy for you. Get one with 4K resolution and HDR and you should be more than happy with the picture quality. In fact, you can’t beat it with a price tag starting at $299.99. There are three model lines I recommend you consider for the perfect picture at a great value, the S405, P607, C807. While I’ll go over each, the major differences are screen size, and the ability to voice search. Roku OS, which is essentially a built-in Roku device. This model pairs 4K Ultra HD with Dolby Vision HDR. This HDR standard is proprietary and produces a larger range of color. However, this standard is backward compatible with HDR10. Honestly, HDR10 is so good, it’s hard for me to notice the upgrade. However, If you are interested in the major differences between these standards, check out my guide on HDR. This model comes with the enhanced Roku Remote which allows you to do voice search and automatically mutes the TV when you plug a headset into the remote. This allows you to watch TV through earbuds if others in the house need some quiet. This TV has a more contemporary slimmer design. There is a model in between the S405 and the C807 named the P607 that comes in a 55-inch display, but the price point makes the C807 a better value. The TCL Roku TV got me down to one remote. I have a Tablo DVR which my antenna connects to. That allows live TV to broadcast on my network. I use the Tablo App on my Roku TV to watch TV. I then have my Xbox One for gaming and Blue Rays. Essentially, the only devices I have in my TV room are the Roku TV and the Xbox. Since the Tablo only needs to connect to my network, it is out of sight closer to where my antenna enters the house. It’s made cord-cutting even easier.